Soon after the war started the military decided that the bodies of all those service personnel that died overseas would remain there until the war ended. This was done in an effort to free up the transportation system for the movement of supplies and personnel required to win the war. This led to a large number of cemeteries scattered around the world. The task of returning the war dead fell to the Army Graves Registration Service. Among their first tasks was a consolidation of the smaller far-flung cemeteries into larger central cemeteries. This consolidation would prove costly as many of our war dead became missing in the process. 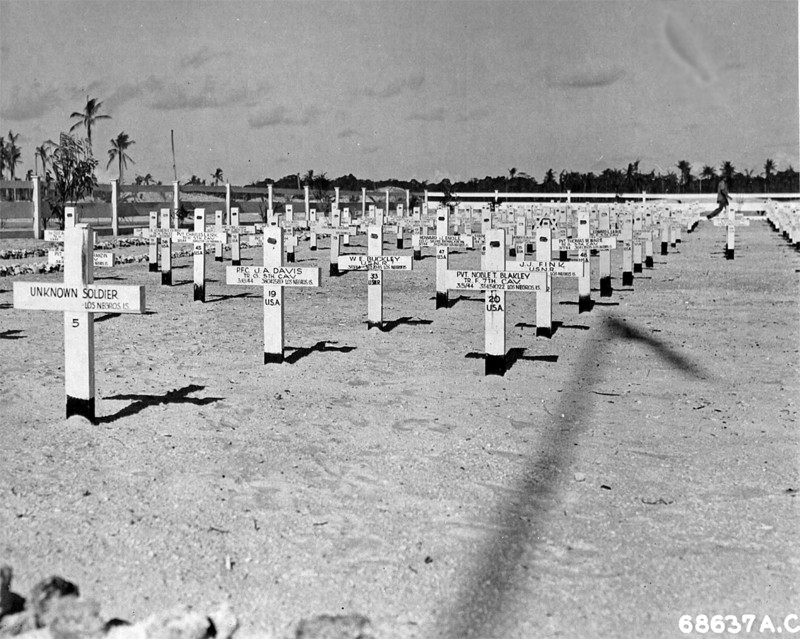 Many readers are unaware of cemetery usage by the military during the war. In an effort to keep it as simple as possible we've dividied them into three types; pre-temporary, temporary and final. The six photographs below are of the Los Negros Cemetery, Admiralty Islands. 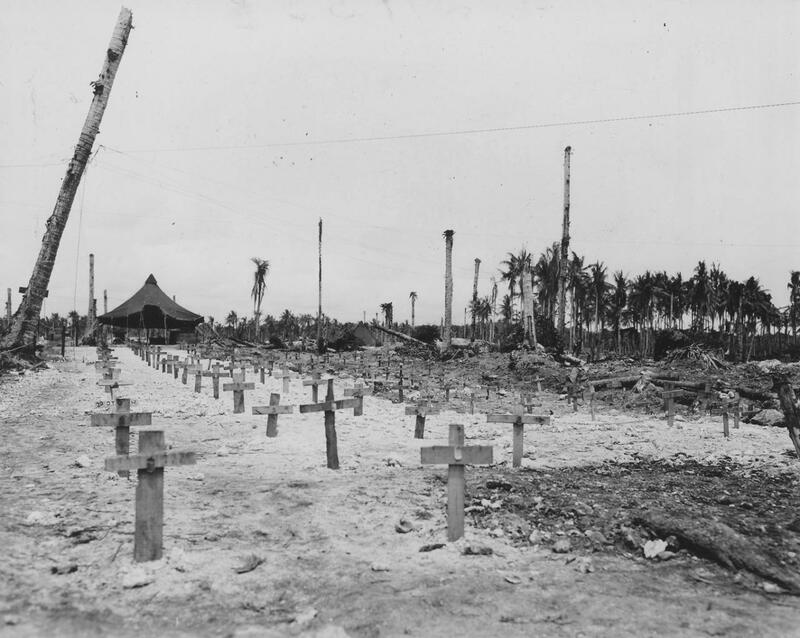 This is an example of a pre-temporary cemetery. Viewing from left to right, the reader can see the cemetery in it's initial stages during the final combat phase on the islands through the beautification stage. In January 1945, the bodies were disinterred and moved to the larger temporary cemeteries at Finschaffen, British New Guniea. Unfortunately the Army GRS people made serious mistakes, and many of the known dead became MIAs. Read the Army report ﻿here﻿. 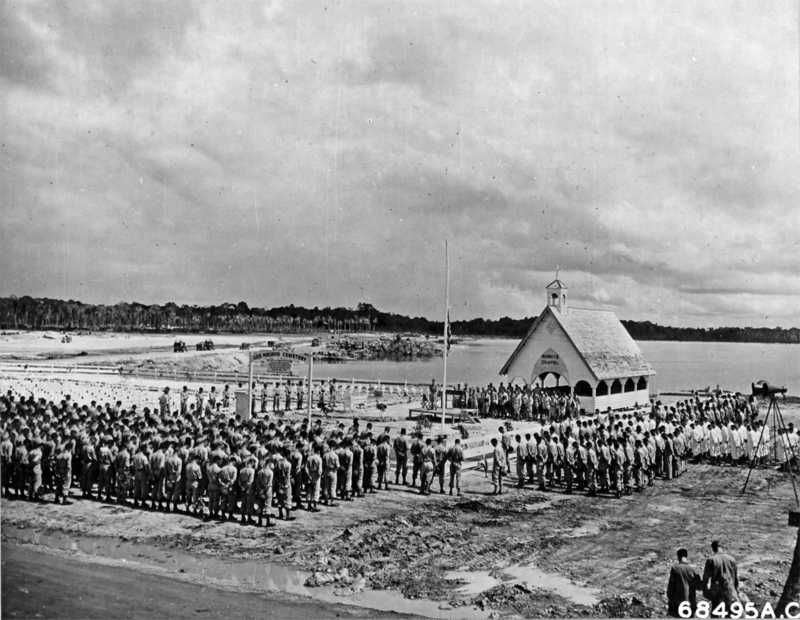 By January 1944 the Gilbert and Marshall Island groups had been secured. In a preparatory move for his return to the Philippines, General MacArthur focused his attention on the Bismarck Archipelago. Among the islands involved were the Admiralty Islands which are located northeast of the eastern tip of New Guinea. The assault on the island group was given to the 1st Cavalry Division of the US Army. This would be the first combat for the division which had spent the early years of the war guarding the Mexican border. The operation had originally been schedule for the April 1944 time frame, but because of faulty intelligence regarding Japanese troop strength on the islands, the date was moved up. The two principle islands of the group are Manus and Los Negros. On the morning of 29 February 1944 the amphibious assault began on the east side of Los Negros Island at Hyane Harbor. The area was close to the Momote airfield, an early objective of the invading forces. The Japanese had anticipated the assault on the opposite side of the island at Seeadler Harbor and had positioned their defenses accordingly. By noon the entire reconnaissance force was ashore with only four of the amphibious craft sustaining damage. The campaign continued through March and April. When it was over 261 Americans had died and were buried on the island. 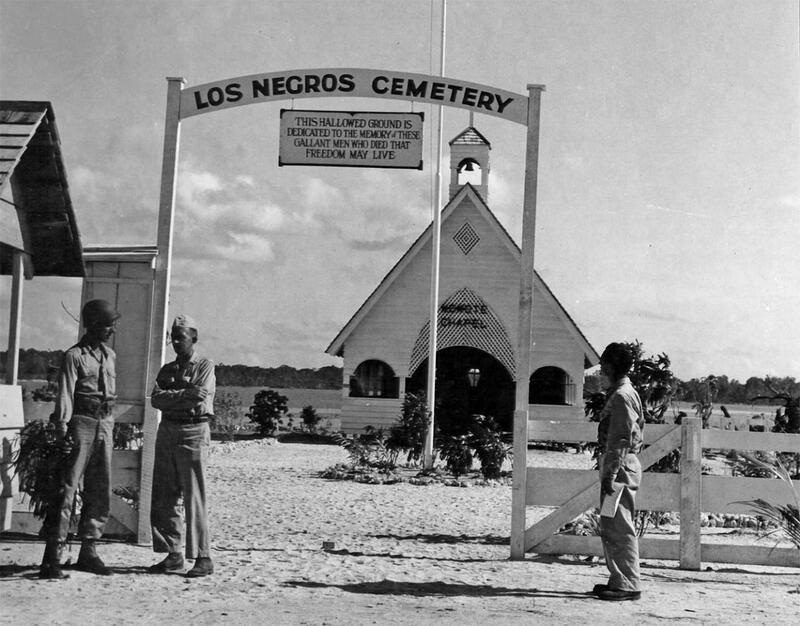 The Los Negros Cemetery (aka Momote Cemetery) was typical of those build while combat operations raged around them. Each soldier carried two dog tags. One was placed with the body and the other hung on a peg or other type marker until more permanent arrangements could be made. 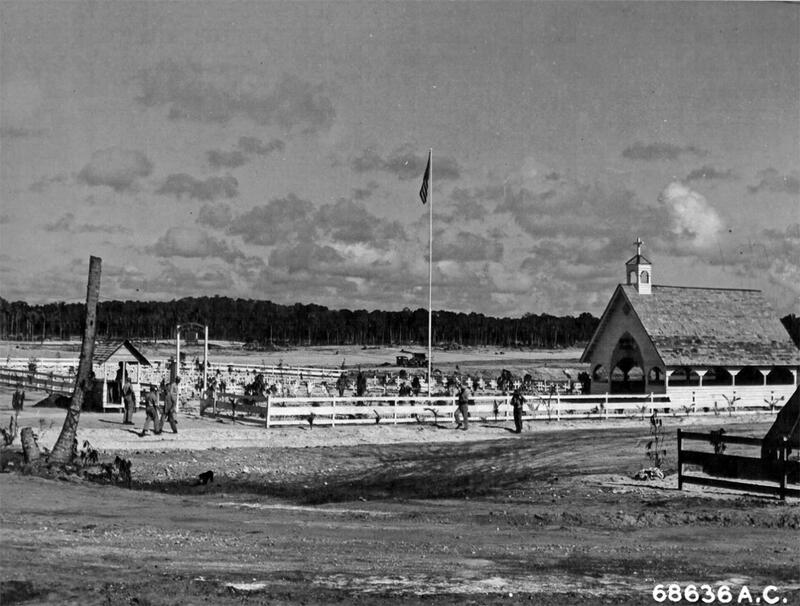 When combat operations ended the cemetery “beautification” program began in earnest. Rubble was removed, the original grave markers and dog tags replaced with a more appropriate marker. A chapel was also added to give a more serene sense to the former combat area. The cemetery remained intact until January 1945 when a detachment from the Graves Registration Service disinterred the remains and move them to the Finschhafen Cemeteries One and Two. During October 1947, the bodies were moved to the Manila Mausoleum, Philippine Islands. Processing of the remains continued until 1950. In the end 77 of the bodies could not be individually identified. Names were associated with 39 of the bodies. The other 38 were Unknown. An Administrative decision was made to place all 77 remains in a group burial at Jefferson Barracks National Cemetery, St. Louis, Missouri. During April 1951, the 77 bodies, in 77 caskets, were interred in section 84 graves 364-384. *- US Navy personnel. All others are US Army, 1st Calvary Division. Of the 38 unknowns, there is no doubt that these 22 are part of this group.